Which Reputation Concepts Are Relevant Today? If having a social media presence is a choice or an important component for a business’ success, then having a proactive social media management strategy is crucial – however positive social media is rarely enough to completely control a business’ or individual’s online reputation. Search optimization is the process of influencing top positions in the search engines by optimizing and promoting websites, content, and other forms of media. In reputation management, the SEO component is designed to infiltrate search results with chosen media content, for the purpose of suppressing negative material that the person or business wants to eliminate. SEO is, or at least should be the central focus of an online reputation management strategy. A reputation repair campaign that does not heavily focus on search optimization is going to fall drastically short of creating the desired result. The assumption is that the individual or business is convinced that the content displaying on the first (and maybe the second) page of the search engine is importance for public impression. Understanding all the factors involved in controlling an entire first page of search results, and having the resources and means to execute on that knowledge is vital. However, even most of the SEO and reputation management service companies today have a limited knowledge of the science, and are lacking the resources to be effective, or are not willing to invest in the time, energy, and technology required to achieve the results for their clients. For any given search query there are hundreds of ranking factors and variables being calculated simultaneously in order to sort and deliver the set of results a user sees. The tactical strategies in this book cover search engine ranking factors in great depth and provide realistic perspectives and instructional resources for achieving the necessary outcomes. In some cases, it is possible to get negative content removed from a website. Usually, this requires a legal letter from an attorney representing the compromised party, or communication with the owner or webmaster of the site in question. Successfully removing negative editorial, reviews, or blog posts are a rare accomplishment in the reputation industry, but it can be done depending on the circumstances. Although these special occasions do exist, one should not expect a successful outcome and base their entire reputation strategy around the hope that content can be successfully removed. The unlikely probability that content will be removed or deleted speaks to the importance of other strategies, such as suppression campaigns through search engine optimization. A strong majority of content cannot be removed by someone who does not own the website it is on, therefore it is important for the person seeking reputation management to consider all forms of solutions for optimizing the name search vertical. DMCA Removals – The US Digital Millennium Copyright Act criminalizes production and dissemination of technology, devices, or services intended to circumvent measures (commonly know as digital rights management or DRM) that control the access to copyrighted works. In the event a copyright, trademark, or other protected intellectual property has been infringed, a “Demand” may be filed with LumenDatabase.org, which sends takedown requests to Google. The Internet is very much like a playground for marketers and programmers with an inclination towards gray area tactics and market manipulation, and many types of automation tools exist for simulating tasks and events online. Everyone is familiar with the concept of computer viruses, wherein a software program infects the host computer or web server and performs certain actions, usually with malicious intent to access, inject, or extract information. Blunders aside, well engineered marketing consistently proves to be a reinforcing asset in a digital reputation campaign and should be a core component to any business that values its online presence as a growth strategy. Occasionally, attempts to hide, remove, or censor a piece of information has the unintended consequence of publicizing the information more widely. This phenomenon is referred to as the “Streisand Effect”, named after the American entertainer Barbra Streisand, whose 2003 attempt to suppress photographs of her residence inadvertently drew further public attention. Similar actions resulting in this effect can include cease-and-desist letters, public statements, appeal procedures, and any action that draws more attention on the negative or unwanted information. Pursuing solutions without a thorough investigation of unforeseen outcomes can result in more detrimental outcomes than existed with the original problematic source or information. 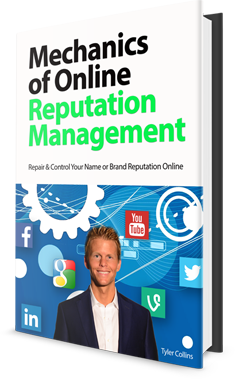 Reputation repair should be thought of as a tactical mission to swiftly control or eliminate negative content online.